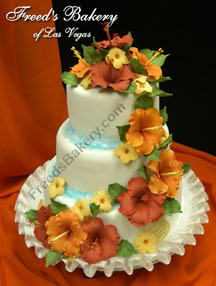 Tropical theme cakes bring a sense of warmth and airiness to your romantic celebration. A tropical theme works best for a summer or a destination wedding on some exotic island. Even if your reception is not taking place in the tropics, you can still create a tropical theme by getting married on a beach with the sound of the ocean waves filling the air and feeling the gentle sea breeze upon your skin. If a beach is not close by, consider having a luau or hosting your reception in a botanical garden. 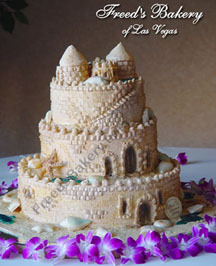 Bring all of your ideas and designs to your baker and together you can design your perfect tropical theme wedding cake. Your tropical creation can be decorated with orchards, hibiscus, begonias, blue passion flowers, or dahlias and then your confectioners delight can be placed on a large stand surrounded with seashells, starfish, pineapples, flowers or sand. Have your tropical theme cake strategically placed in your bridal hall so your guests can see your beautiful creation upon arrival at your reception. 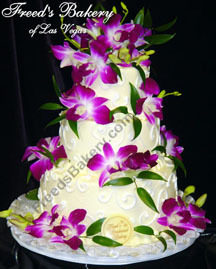 The above three tier fuchsia swirl cake created by Freed's bakery will liven up your reception hall. If you've overspent on a few of your other wedding items and need to save a few bucks, consider baking your own masterpiece. After all, why pay for an expensive, bakery made dessert, when you can easily bake your own. At first, the thought of creating a tiered cake may seem overwhelming but making a tiered bridal cake is not as difficult as it seems. You can enroll in a High School cake and decorating class and learn some tricks to create your own beautiful bridal dessert. Ask a friend to help and try making your creation well before your wedding to determine if you're satisfied with the results. The secret behind every wonderful baked good is in the baking pans. Be sure to purchase pans that will work for you and have a money back guarantee. 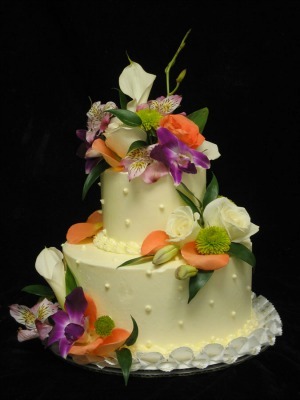 Fresh flowers are much easier to place on your cake than making your own design from fondant or butter cream. 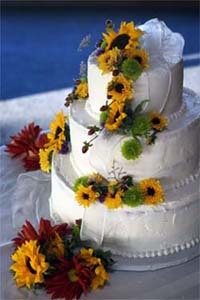 Your tropical theme wedding cake designs will be beautiful to view and will definitely enhance your cake cutting photo. The above masterpiece was created by Freedsbakery.com. Now that you have your cake ideas down pat, let's look at some other planning options for your magical day.